This roomy 2 room suite is a vibrant explosion of Spring colors, with sunny yellow walls and accents of rose and pinks around the room and with plenty of closet space to unpack and relax. The room features a queen size bed made with high quality sheets and fluffy pillows. 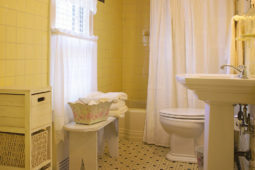 Off the bedroom, is a large private bathroom, and a roomy shower. The luxurious sitting room highlights an antique couch, a large flat screen TV and a DVD/ CD player. This room is a perfect fit to relax, make yourself comfortable and make our home your home away from home. 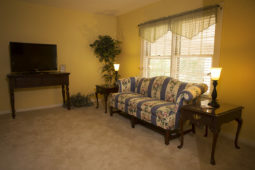 Includes antique couch, a large flat screen TV and a DVD/ CD player. Each room at the Colonial Manor Bed and Breakfast comes with a Flat Screen TV along with a DVD Player. We have a DVD library where you can pick any movie of your choice. We offer free WiFi for all of our guests! Please ask for the password at check-in. A Homemade Breakfast is included for the duration of your stay! We know our way around the kitchen and cannot wait to feed you. Each room contains a mini fridge for extra convenience.